These are photos from select older Paintouts. 'Hover' over the image to see the caption and select the image to enlarge. 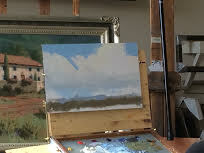 Tom Blazier's demo painting at the Monsoon Madness Paintout.